How is a raven like a writing desk or better yet, how are Blaise Pascal, Ingrid and cedar waxwings connected? Think of it as a triangle ▲ with Blaise Pascal on top. 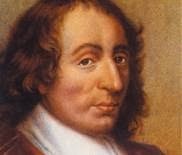 He was the amazing mathematician who invented the first digital calculator, opened new fields of study in atmospheric pressure, hydraulics, projective geometry, probability theory, invented Paris' transit system and a ton more as well as becoming a philosopher of note. Right now I'm reading 'Pensees'; it is hard work but worthwhile. It is full of little brain jerk-awakers; they may not make me rich but keep me on my mental toes. On one of the other sides, there are cedar waxwings. 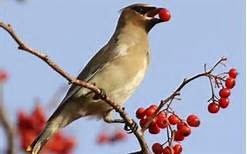 They are cheery little birds which eat mainly berries, are very social and handsome . They are yellow and grey with little red markings on their wing tips. Their numbers are stable or even increasing due to the fruit trees homeowners are planting. Courting birds feed one another. A gang of them eat my ornamental crabapples nearly every day. M. Pascal theorizes that man is chronically unhappy because he/she lives either in the past, looking back to a perception of happiness or in the future, always planning on being happy and working toward that end. There is no happiness in the present because WE MISS IT. I love it because it's true! Busy, busy people even on vacation, always racing around on tours, shopping, dining and always, always connected somehow to something disruptive. There is hardly time to savour the moment. This has been described variously as ecstasy, bliss, joy or just the moment. At our age, we need to be way more conscious of this. Some of us don't have a lot of future in our future, and none of us have a guarantee that there will be any at all. Today, now is all we have.